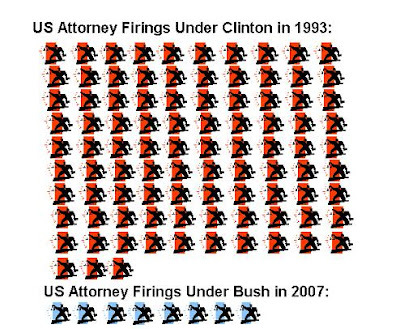 After the Evil Genious Karl Rove talked about firing all 93 US attorneys under President Bush- They didn’t. And… after the Clintons talked about firing all 93 US attorneys under President Clinton to save a friend who was being investigated for corruption by one of the attorneys- They did. Powerline says it is a “scandal” that refuses to grow. Flopping Aces sees another breakdown on the way. Althouse notes the NYT’s obvious spin on the firings. Here’s a bug for those on the clueless left – the administration doesn’t have to tell anyone why they fire someone who serves at the expressed pleasure fo the President. It probably wouldn’t hurt if the administration borrowed that line.